While these publications are geared toward cities and counties, special purpose districts will also find the property tax information helpful. We’ve also addressed other topics that were not previously included, such as impact fees and the county rental car sales tax for public sports, as well as clarifying the difference between the “basic” or “state shared” lodging tax and the “additional” lodging tax. When do you need the revenue? Different revenue sources – especially property taxes and sales taxes – have different implementation timelines set by statute that require you to plan ahead. How does election timing affect voter turnout and election costs, and when is validation likeliest to be a problem? What are correct and incorrect ways to frame a multi-year levy lid lift? 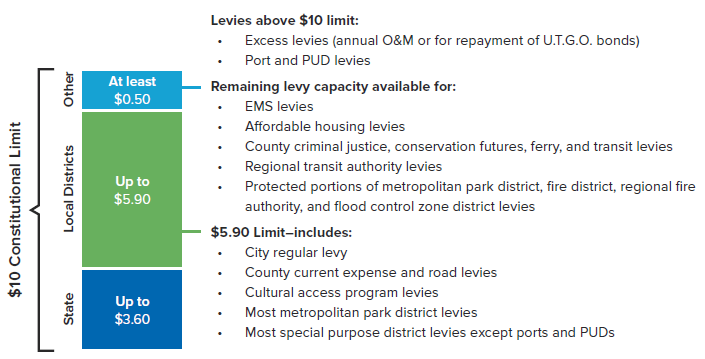 What happens to a county’s road levy shift if the $5.90 or $10 property tax limit is exceeded? We’ve added a number of tables and graphics to help explain certain revenue sources, including many of the property tax topics we listed earlier, as well as how revenues are shared between cities and counties for certain sales taxes. We’ve significantly expanded the interactive elements in this publication. Not only can you click on an item in the table of contents to go directly to that page, but we’ve also added a navigation panel allowing you to quickly and easily go to the previous page, the next page, the last page you viewed or back to the table of contents. Plus, we’ve got links to a number of useful online resources from MRSC, the State Auditor’s Office and other entities. You can learn more in the “How to Use this Document” section near the beginning of each publication. We recommend using Adobe’s free Acrobat Reader software program to ensure maximum functionality. The Revenue Guides are organized by type of revenue – property taxes, sales taxes, real estate excise taxes, state-shared revenues, etc. But what if you’re just looking for, say, transportation or law enforcement revenues? We’ve got you covered! Each document has a number of appendices listing major revenue sources by program area, so that you can see all major revenue options in one place, along with a brief description, eligible jurisdictions, and whether the revenue source requires voter approval. Plus, you can link directly back to each revenue source within the guide for a more thorough explanation, or you can click through to the relevant RCWs. Now that this new edition is complete, we will continue to update these publications as needed to reflect new legislation or other changes or clarifications. We anticipate the first update this summer, after the current legislative session has concluded. Our intent is that these guides will be “living” documents that will continue to grow and evolve over time. Each publication has a revision history at the beginning showing the most recent changes. You can download the City Revenue Guide and County Revenue Guide from MRSC’s website, as well as from the State Auditor’s Office Center for Government Innovation Resources Database. Happy reading! If you have any questions, comments or suggestions regarding these documents, please contact us at tnelson@mrsc.org and shawley@mrsc.org.